Submitted Photo New nutrition facts labels make calorie contents more visible and note the amount of added sugars contained in the total count. Cornell Cooperative Extension Chautauqua County’s EFNEP Program would like to share information on Food Nutrition Labels. 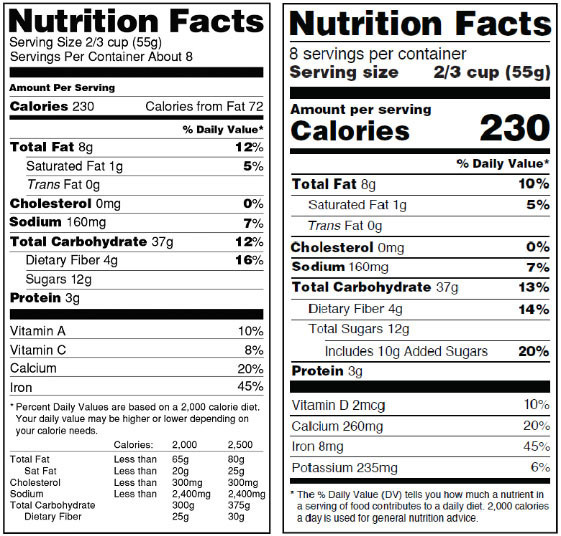 Food nutrition labels are getting a makeover, which will be a big boost to anyone setting healthy eating intentions for 2019. As you shop at the grocery, explore how labels are evolving. Over time, you will find the total calories per serving is predominantly shown in large, bold type. This added visibility will make it easier to be mindful of what you are consuming each day. Serving sizes are becoming more realistic. If you grab for a bottled beverage, the calorie counts shown on new labels are per bottle, not whatever fraction of the bottle somebody once thought was appropriate. Who drinks a third of a bottle, right? If you watch your sugar, the new labels will report sugar content in two categories: naturally occurring and added sugars. If you are making resolutions for the New Year, start by thinking about something that is a hindrance to your enjoyment of life, and consider ways to alleviate that. When it comes to food — you don’t need a strict diet! Anyone can strive to nourish their bodies a little better. One small tweak can make a huge difference. Instead of denying yourself things you enjoy, what if you work on ADDING things that really nourish your body? Consider finding out what your recommended daily allowance is of water (at least half your weight in ounces), and aim to drink that every day. Maybe you want to add more vegetables — can you eat your daily servings of vegetables today? Maybe you want to set one healthy intention today, and another tomorrow — that’s fine! It’s your body, and you make the rules. Look at your gains over the course of a week. One off-day does not a failure make. If increasing your activity level is of interest, tune in again and think about what you can do to get more enjoyment out of your days. For instance, if you experience back pain, strengthening your trunk with something like a plank practice might help. Not sleeping so great? Consider a short walk outside a few times this week and see if you notice a difference. Whatever you do, start small and add time or intensity only as you feel ready to. Returning to that plank practice: you could begin by keeping your knees on the ground. You can also try resting on your forearms, instead of your hands. If you’re looking to add more steps to your day — try walking all the aisles of the grocery store, instead of just the ones that have what you need. Get up and down off the floor at least once every day so you’re better able to do it all of your days! You’re more likely to let your intention go if you get frustrated. Keep it simple and make it something that you want to do every day. Don’t worry if you miss a day, but try not to let more than three go by without playing with your idea. Patience is key. The things we most seek to change are not often things that happened overnight. It took time to get where you are, and it will take time to get where you are going. Isn’t it great that to have the ability to alter your course? Set intentions with kindness and self-respect, and celebrate any opportunity to make changes. The EFNEP Program is one of many programs offered by Cornell Cooperative Extension of Chautauqua County (CCE-Chautauqua). CCE-Chautauqua is a subordinate governmental agency with an educational mission that operates under a form of organization and administration approved by Cornell University as agent for the State of New York. It is tax-exempt under section 501(c) (3) of the Internal Revenue Code. The association is part of the national cooperative extension system, an educational partnership between County, State, and Federal governments. As New York’s land grant university Cornell administers the system in this state. Each Cornell Cooperative Extension association is an independent employer that is governed by an elected Board of Directors with general oversight from Cornell. All associations work to meet the needs of the counties in which they are located as well as state and national goals. For more information, call 716-664-9502 or visit our website at www.cce.cornell.edu/chautauqua. Cornell University Cooperative Extension provides equal program and employment opportunities.